A scar is a mark on the skin as a result of trauma to the skin. Scars can be the result of an operation, an accident, a disease (chickenpox, etc.) or an infection (acne, peritonitis, etc.). A repair process takes place after this trauma, which leads to the final appearance of the scar. This can evolve over several months or sometimes several years. The skin repair process, called healing, will involve several periods. In the days that follow, the scar is small and discreet. In the weeks following the operation, it will enter an inflammatory phase and become red and swollen to a lesser or greater extent, depending on the type of skin. In the months following the operation, it will whiten, flatten and soften, leaving an almost invisible fine white mark, often less visible than a simple stretch mark. It can, though, be the case that the area is deformed, even if the skin has healed well. If the skin has not healed well, the mark is more prominent and will be coloured, blistered or enlarged, requiring medical or surgical treatment. Retractile scars: these deform part of the body and can impair mobility, which can be limited by the scarring, whether on the face or joints. Hypertrophic or keloid scars: they remain chronically inflamed, painful, red, puffy and enlarged. With dehydration, they sometimes have a tendency to stretch neighbouring tissues. Unsightly scars: these scars are particularly conspicuous because they are large, colourful, irregular and deform a region (causing raised areas, hollows, irregular contours). During the first consultation, it is important to identify the causes and development of the scar. Following this assessment, I will examine you and offer one or more solutions. So you can visualise the desired result, I will show you photos of cases similar to yours so you can understand the objective of the intervention. I will then give you all the information on the proposed techniques and information sheets from the Société Française de Chirurgie Plastique Reconstructrice et Esthétique (French Society of Plastic, Reconstructive and Cosmetic Surgery) as well as a detailed estimate of the costs, according to the options you have chosen. No examination is usually necessary unless you are having a general anaesthetic (possible blood test). If you are having a general anaesthetic, you will need a consultation with the anaesthetist in the weeks preceding the operation and at least 48 hours before. If you are having a general anaesthetic, you must fast strictly for 6 hours before the operation (do not eat anything, chew gum, eat sweets, or smoke). For a local anaesthesia, it is recommended to drink and eat lightly at normal mealtimes. Protect it from the sun with a sun protection cream and maximum protection factor applied several times a day, a dressing and covering up with clothing, etc. Massage it regularly with a moisturising cream. Before treatment, I will go over with you the exact objective that we agreed upon during the consultations. You can then always make recommendations or ask any questions. I will then draw the marks to guide the treatment on your skin. Currently, the new Q-Switched (RevLite® laser) and non-ablative (Icon® laser) fractional lasers are proving to be very effective in reducing swelling and redness. Using a silicone plate or gel may also be recommended as a single treatment or in addition to the laser to minimise redness and swelling. You may also need to apply corticoids to the area, either by massaging in a corticoid cream or the surgeon injecting the corticoid into the scar in the medical clinic under local anaesthetic. It is important to take care to ensure the corticoid cream is never covered by a silicone plate. In cases of hypertrophic or keloid scars that have not been sufficiently dealt with through medical treatment early on and are large in size, a surgical excision may be necessary, with another medical treatment to prevent recurrence as far as possible before and after the operation (laser, corticoid, silicone...). Injecting corticosteroids into the scar, which is carried out by the surgeon in his clinic under local anaesthetic. This can sometimes soften the scar and loosen the underside but, in the majority of cases, a surgical procedure will be necessary. Exfoliation of the scar and reorientation of its supporting axis to reduce tension on the sides of the wound banks and regain natural shape and mobility. For very tight or traumatic scars, we can use local tissue, either from a skin graft taken from another area or by a procedure to take a flap of skin from a nearby area, which will give more body to the scar area. In some cases, skin expansion can be used by placing inflatable balloons (skin expanders) that gradually stretch the skin around the scar over several weeks to cover the scar area without any tension. The less tension on the surface, the better the orientation of the fusiform excision. 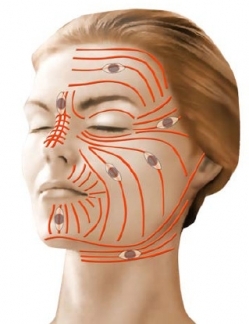 Smoothing the scar roughness by laser or dermabrasion. Filling indentations with lipofilling (injecting your own fat) or injecting hyaluronic acid. Treatment can be carried out in the doctor's office or at the clinic. If you need to stay in hospital, this is usually limited to half a day in a day hospital. For people with extensive scarring, an overnight hospital stay is sometimes necessary. The scar should be cleaned daily with an antiseptic. The stitches are very fine and absorbable and do not need to be removed. You will need to attend a follow-up visit one week after the procedure. For all treatments, regular monitoring visits should be made according to the pattern of development. Exposure to the sun: no direct exposure before 6 weeks then exposure is possible using a sun protection cream with a maximum protection factor. Make-up: any bruises can be hidden by a cover-up cream the day after the treatment and your usual make-up can be applied on top of this. The products used must be adapted and designed for post-operative use. They will be prescribed to you on a post-treatment prescription. The assessment of the result takes several months and sometimes up to a year or two before the scar takes its final form. Healing is a random phenomenon, depending largely on the patient's skin type. To obtain the best possible result, the development and appearance of the scar must be regularly checked to use treatments to control the quality of the wound healing. If the reason for the operation is purely aesthetic, you cannot get reimbursement through a Social Security claim. On the other hand, if the scar causes functional discomfort or deforms a part of your body, there may be compensation through Social Security and, if necessary, by your mutual insurance company. This also applies if the treatment is for reconstructive purposes after an accident or an illness. A detailed estimate is given to you during the first consultation according to the options chosen. You then have a minimum legal period of 15 days to consider your options and take your project forward. The photographs on this page illustrate and complete the information given on the operations. They are merely for information purposes so you can see the goals, results and scars from the operation.